Every individual requires a series of basic needs to be met in order to reach their highest possible level of functioning. Basic needs include but are not limited to food, shelter, and health care. By offering services that address the basic needs of an individual, the HOPE Campus’ client-centered approach to rendering services encourages clients to actively engage with their progress so that they may attain a higher level of functioning. HOPE Campus supports clients’ basic needs so that they have the mental and financial resources to devote their time to other necessities that are essential for their self-sufficiency. For some clients, this will include addressing the root causes of addiction and mental illness, and for others it will include reaching education and employment goals. 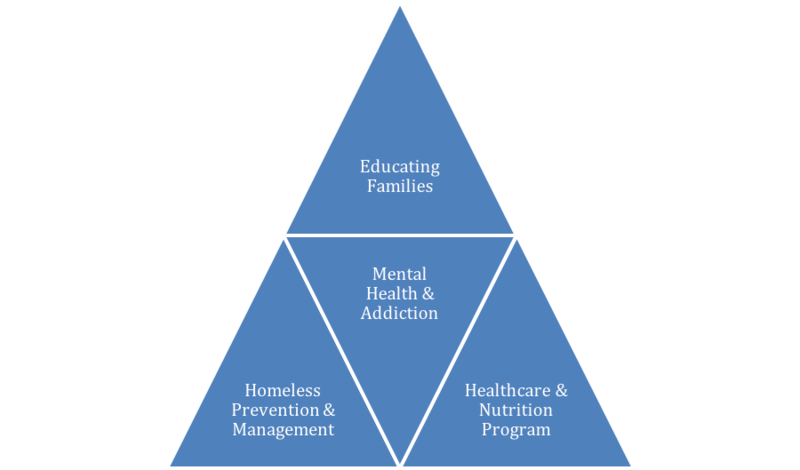 The Four Pillars of HOPE is a system of programs that address the needs of an individual as they correspond to typical basic needs. Each Pillar is designed to address a different need, while advocating for individuals to actively engage with their Case Plan. Though every individual’s Case Plan will differ, the Four Pillars of HOPE will act as a guide of what typical treatment will resemble, and of the heart of HOPE Campus. Each Pillar works in conjuncture with the others to ensure no basic need goes unmet. Case managers will meet with clients once per week to discuss client progress and their engagement with their case plan. In the Nutrition Program Clients are welcome to receive nutritious meals for breakfast, lunch, and dinner. Whole grains, vegetables, lean meats, plant-based proteins, and fresh fruits are all served by our professionally trained Chef. Additionally, Clients are welcome to receive medical treatment at the adjacent HOPE Clinic, where they will be assessed and their Basic Health Indicators charted. Clients are encouraged to adopt healthy eating habits, learn how to prepare and cook nutritious meals for their family, and learn in a classroom setting how food affects the body and any ailments. Once the program is completed, clients are invited to apply for employment with one of two HOPE Campus Partners, who have agreed to accept all applications received from graduates of the Nutrition Program. Free, nutritious meals for adults and children. Nutrition education including how life habits and diet affect ailments and general health. This Pillar involves giving a free bed to anybody in the community who is without shelter for the night. Additionally, those in need of hygiene products will be given the proper supplies to take care of their bodies, this includes lice treatment, athletes foot treatment, and education regarding proper hygiene etiquette. Feet cleaning services including antifungal powders and self-care instruction.